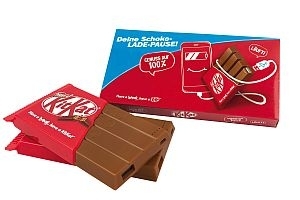 Huff Werbeartikel is presenting a power bank in the shape of a KitKat, which in line with the well-known slogan gives the smartphone a break and provides it with new energy. The world may not stand still when the power bank is extracted from one’s bag – after all in the case of the model made of ABS plastic none of the bars can be broken off – but thanks to the realistically-like torn open packaging, the mobile energy supply for smartphones, tablets and co. simply looks good enough to sink one’s teeth into. The power bank was implemented for the prize draw of a customer at the POS and is such a deceptively real imitation of the chocolate bar filled with wafer that the Jury of the Promotional Gift Award 2018 thought it deserved a distinction in the category Custom-made Designs. One of the few visual differences to the chocolately original is the practical charging display on the top bar. In this way, the model is not only popular with fans of the crispy classic, but also convinces with its communicative potential, design quality and high practical value.